Scientists at MIT report that by delivering a combination of antibiotic drugs and probiotics, they could eradicate two strains of drug-resistant bacteria that often infect wounds. To achieve this, they encapsulated the probiotic bacteria in a protective shell of alginate, a biocompatible material that prevents the probiotics from being killed by the antibiotic. The team’s study (“Biofilm-Inspired Encapsulation of Probiotics for the Treatment of Complex Infections”) is published in Advanced Materials. “The emergence of antimicrobial resistance poses a major challenge to healthcare. Probiotics offer a potential alternative treatment method but are often incompatible with antibiotics themselves, diminishing their overall therapeutic utility. 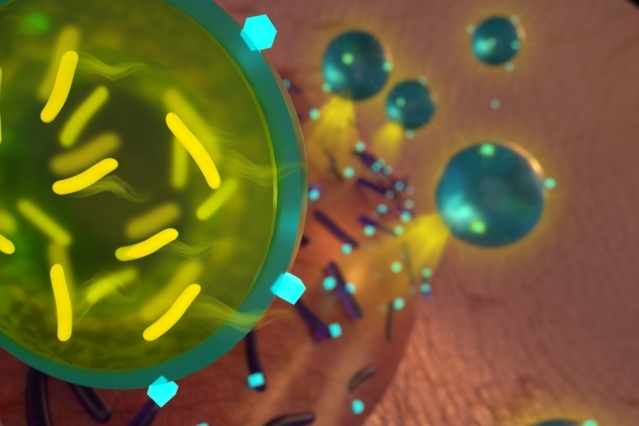 This work uses biofilm-inspired encapsulation of probiotics to confer temporary antibiotic protection and to enable the coadministration of probiotics and antibiotics,” write the investigators. “Probiotics are encapsulated within alginate, a crucial component of Pseudomonas biofilms, based on a simple two-step alginate cross-linking procedure. Following exposure to the antibiotic tobramycin, the growth and metabolic activity of encapsulated probiotics are unaffected by tobramycin, and they show a four-log survival advantage over free probiotics. This results from tobramycin sequestration on the periphery of alginate beads which prevents its diffusion into the core but yet allows probiotic byproducts to diffuse outward. “There are so many bacteria now that are resistant to antibiotics, which is a serious problem for human health. We think one way to treat them is by encapsulating a live probiotic and letting it do its job,” says Ana Jaklenec, Ph.D., a research scientist at MIT's Koch Institute for Integrative Cancer Research and one of the senior authors of the study. If shown to be successful in future tests in animals and humans, the probiotic/antibiotic combination could be incorporated into dressings for wounds, where it could help heal infected chronic wounds, the researchers say. Robert Langer, Sc.D., the David H. Koch Institute Professor and a member of the Koch Institute, is also a senior author of the paper. Zhihao Li, a former MIT visiting scientist, is the study's lead author. Scientists have previously tested the idea of applying probiotics to chronic wounds, and they've had some success in studies of patients with burns, Li says. However, the probiotic strains usually can't combat all of the bacteria that would be found in an infected wound. Combining these strains with traditional antibiotics would help to kill more of the pathogenic bacteria, but the antibiotic would likely also kill off the probiotic bacteria. The MIT team devised a way to get around this problem by encapsulating the probiotic bacteria so that they would not be affected by the antibiotic. They chose alginate in part because it is already used in dressings for chronic wounds, where it helps to absorb secretions and keep the wound dry. Additionally, the researchers also found that alginate is a component of the biofilms that clusters of bacteria form to protect themselves from antibiotics. For this study, the researchers chose to encapsulate a type of commercially available probiotic known as Bio-K+, which consists of three strains of Lactobacillus bacteria. These strains are known to kill methicillin-resistant Staphylococcus aureus (MRSA). The exact mechanism by which they do this is not known, but one possibility is that the pathogens are susceptible to lactic acid produced by the probiotics. Another possibility is that the probiotics secrete antimicrobial peptides or other proteins that kill the pathogens or disrupt their ability to form biofilms. The researchers delivered the encapsulated probiotics along with the antibiotic tobramycin, which they chose among other tested antibiotics because it effectively kills Pseudomonas aeruginosa, another strain commonly found in wound infections. When MRSA and Pseudomonas aeruginosa growing in a lab dish were exposed to the combination of encapsulated Bio-K+ and tobramycin, all of the pathogenic bacteria were wiped out. When they tried the same experiment with nonencapsulated probiotics, the probiotics were killed by the antibiotics, allowing the MRSA bacteria to survive. “When we just used one component, either antibiotics or probiotics, they couldn't eradicate all the pathogens. That's something which can be very important in clinical settings where you have wounds with different bacteria, and antibiotics are not enough to kill all the bacteria,” according to Li. The researchers envision that this approach could be used to develop new types of bandages or other wound dressings embedded with antibiotics and alginate-encapsulated probiotics. Before that can happen, they plan to further test the approach in animals and possibly in humans.